The city of Lachish (Tell ed-Duweir in Arabic) was located about 30 miles southwest of Jerusalem, nestled in the foothills, the Shephelah, of Judah. The site covers about 18 acres. It was previously a principle Canaanite city and then after the conquest under Joshua, it was one of the most important Israelite cities. 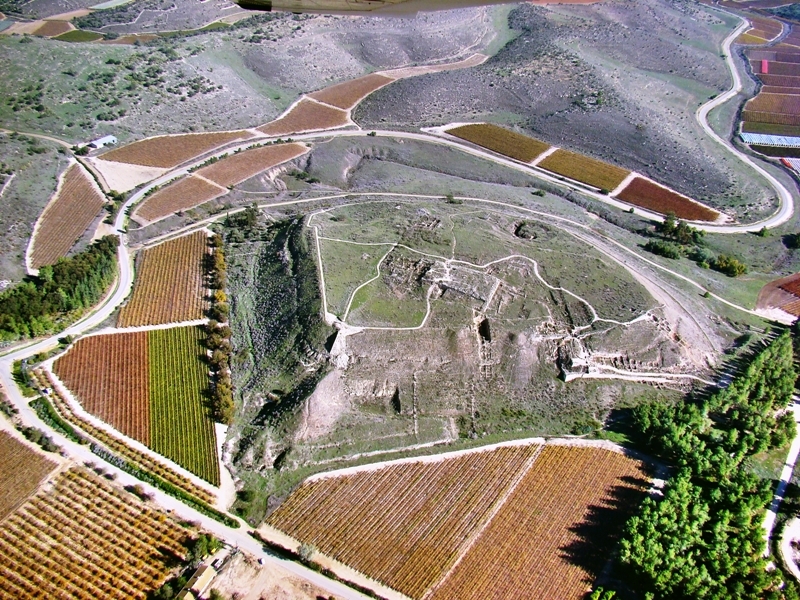 Our photo gives an aerial view of biblical Lachish. Aerial of Lachish, one of Judah's most important cities. Photo ©Leon Mauldin. On the far right the siege mound built by the Assyrians under Sennacherib in 701 B.C. can still be seen. You can also see the ancient wall of the city and the gate complex. 1. Rehoboam, Solomon’s son, rebuilt Lachish as a city for defense, a fortified city (2 Chron. 11:5-11). 2. Later, King Amaziah of Judah, following his apostasy from God (he began worshiping the gods of Edom), was killed while hiding in Lachish (2 Kgs. 14:19; 2 Chron. 25:27). 3. Sennacherib, king of Assyria, captured Lachish (2 Kgs.18:13-17; 2 Chron. 32:9). He considered its capture to be of such significance that he depicted it in elaborate relief on the wall of his palace at Nineveh, as illustrated in our photo here below. 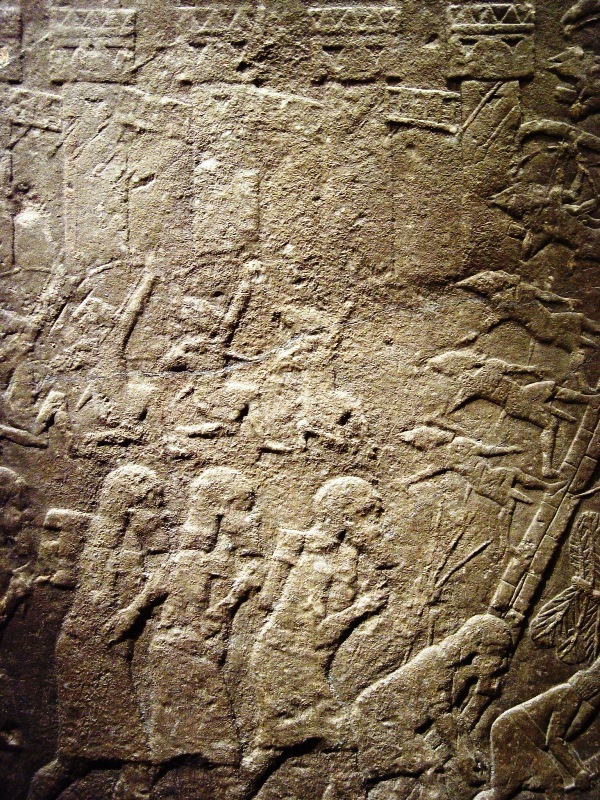 Note the Assyrian archers; others are scaling the wall by means of a ladder. Lachish Relief. Metro Museum NY. Photo ©Leon Mauldin. Additionally, Lachish is known for the “Lachish Letters,” twenty-one pottery sherds on which were written letters in clear Hebrew information regarding the attack on Lachish and Jerusalem by Babylon in 586 B.C. One of those letters says that the signal fires from Azekah could no longer be seen. Just prior to that, Jeremiah had observed that only Lachish and Azekah were left as fortified cities in Judah (Jer. 34:7). After Jacob and his family had a happy meeting/reunion with his brother Esau, Jacob journeyed to Succoth and built a house there (Gen. 33:17). The time is not specified, but it must have been some years. Then Jacob made his way to Shechem (v.18). Shechem was the very location where Abram was when God promised him the land of Canaan (Gen. 12:6,7). It would turn out that Shechem was the site for many significant biblical events. Shechem was the site for many impt biblical events. Photo ©Leon Mauldin. Our photo shows the city of Shechem in the foreground. In the distance you can see Mt. Gerizim, the mountain referenced by the woman of Samaria as she conversed with Jesus in John 4 (v.20). Jacob bought a parcel of land at Shechem (Gen. 33:19); it was here to his sorrow that his daughter Dinah was violated (Gen. 34:2). Later when the family was residing to the south in Hebron, the sons of Jacob tended sheep at Shechem before moving their flocks on to Dothan where they sold Joseph into slavery (Gen. 37:12-28). One of the more fascinating events at Shechem was the confirmation of the covenant during the Conquest of Canaan. 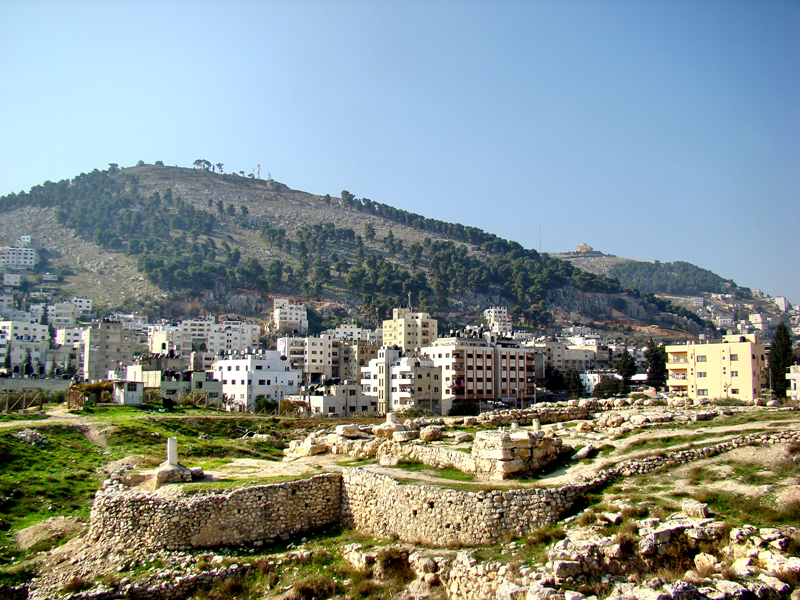 Shechem is situated between Mt. Ebal and Mt. Gerizim. Prior to the Conquest, Moses instructed the nation of Israel that when they crossed over the Jordan, they were to journey to this location. Six tribes were to stand on Mt. 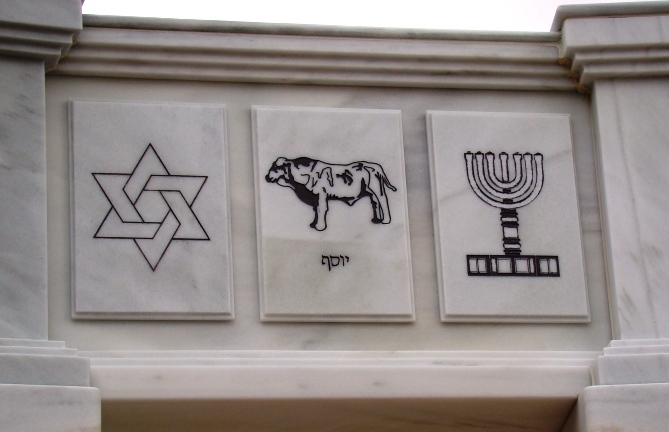 Gerizim (for blessing), and the other six on Mt. Ebal (for cursing). All of the words of the law, the blessings and the curses, were to be read. All the people were to answer, “Amen.” Immediately, after the conquest of Jericho and Ai (Josh.6-8), Joshua led the people north to these two mountains, where they obeyed God’s instructions (Deut. 27; Josh 8:30-35). Think of it! At the very spot where childless Abram stood when God made the land promise, now were 701,730 men of war, plus women and children, there to stake their claim on the land! Shechem would also be the gathering point for all of Israel for Joshua’s farewell address. It was here that he challenged the people to fear the LORD and serve Him in sincerity and in truth, and to put away all the idols and false gods that were among them. His own choice has been an encouragement to many down through the years: “but as for me and my house, we will serve the LORD” (Josh. 24:14,15). Their covenant with God was then renewed there at Shechem (Josh. 24:25). Later in that same chapter, notation is made that Joseph was buried in Shechem (Josh. 24:32). Some of our recent posts have dealt with Jacob’s twenty years stay in Haran, during which time eleven of his twelve sons were born. Benjamin, the twelfth son, was born after their return to Canaan. At the museum at Caesarea Maritima there is an open air display which honors “the five outstanding Statesmen whose brave and timely decisions led to the creation of the state of Israel.” These are Hertzl, Balfour, Truman, Weizmann, and Ben-Gurion. 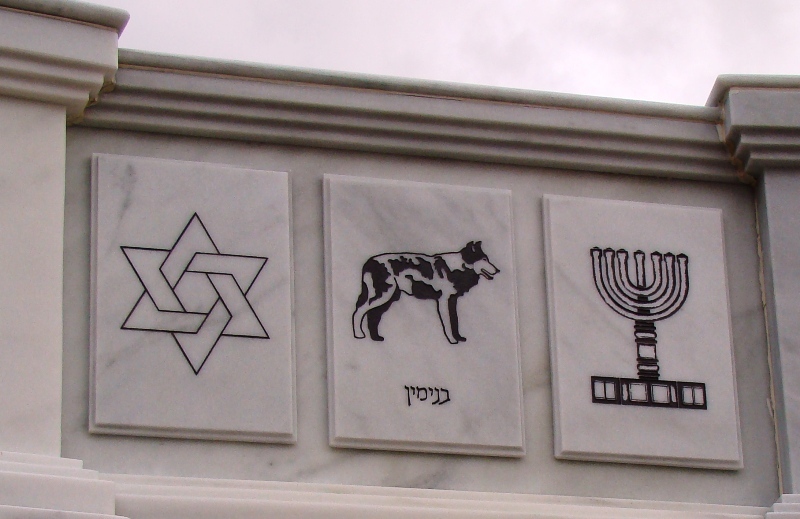 The exhibit also commemorates the twelve sons of Israel, displayed at the top of the semi-circular structure. Commemoration of Statesmen at Caesarea Maritima. Photo ©Leon Mauldin. After Jacob and his family left Laban at Mizpah, he made his way to Gilead. It was there that the Messenger of the Lord told him, “Your name shall no longer be called Jacob, but Israel; for you have struggled with God and with men and have prevailed” (Gen. 32:28). 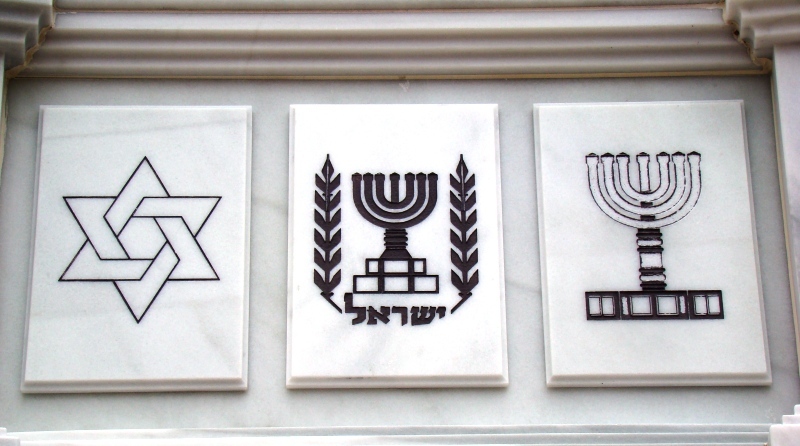 In our photo below, the plaque designating Israel is shown. Though Jacob had four wives, it was Rachel whom he had chosen, the one with whom he was truly in love. Rachel had two sons. Joseph was born in Haran. Joseph, Rachel's son born in Haran. Photo ©Leon Mauldin. Benjamin was born “when there was but a little distance to go to Ephrath” (Gen. 35:16). Rachel died while giving birth to him. Benjamin’s plaque is featured below. Benjamin. Rachel died while giving birth to him. Photo ©Leon Mauldin. From the twelve sons of Jacob the twelve tribes of Israel would develop. As the biblical narrative unfolds, Jacob will adopt the two sons of Joseph, Ephraim and Manasseh, and Levi will become the priestly tribe. I’m currently attending the ETS and SBL meetings in Atlanta, and enjoying sharing a room with bro. Ferrell Jenkins. A couple of the presentationstoday have been on biblical Gezer. This city was given as a dowry to Solomon by Pharaoh when he married Pharaoh’s daughter. 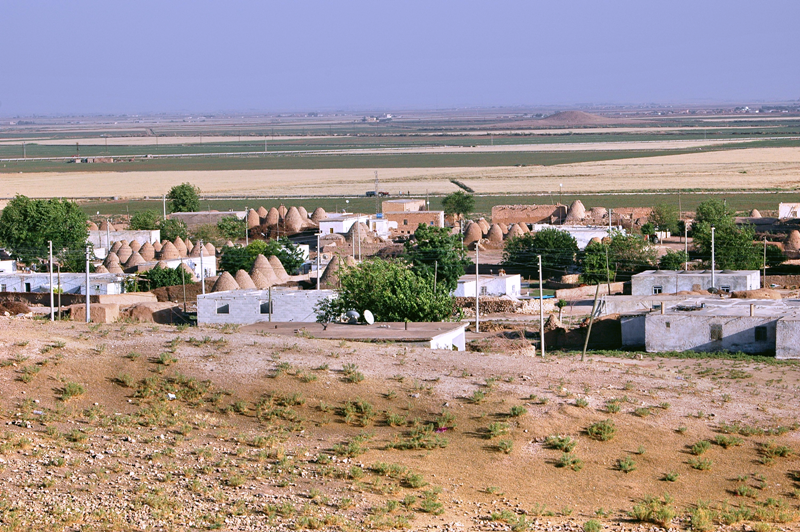 Gezer became a fortress city, guarding access to the south. Excavation is ongoing. 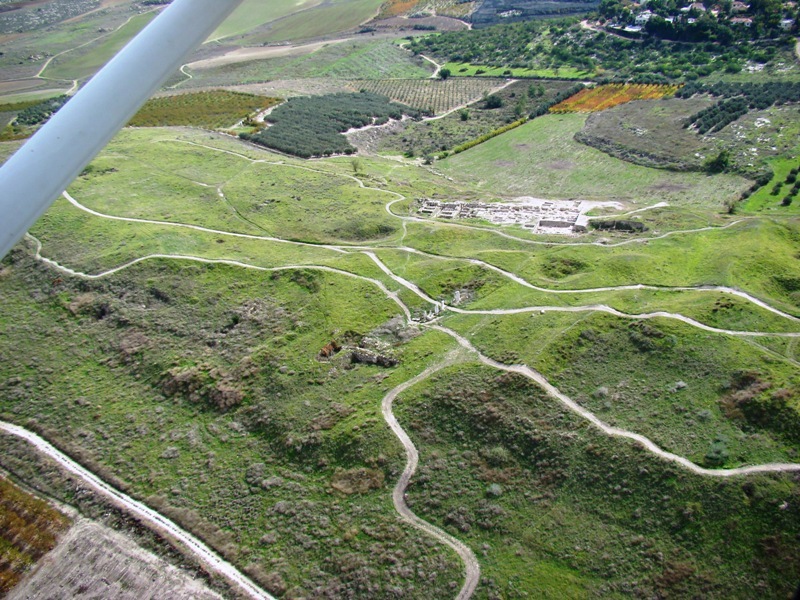 Today’s post features an aerial photo of Gezer, taken last year (Dec. 2009). Aerial photo of Gezer. Photo ©Leon Mauldin. In the center of the photo you can see Gezer’s “standing stones.” Upper right show an important area of excavation, including the six-chambered gate. After Jacob lived in Haran for a total of twenty years (see our previous couple of posts) he made his way back to Canaan. Besides the fact that he was ready to leave Haran for personal reasons (Gen. 31:1-2), the Lord instructed him, “Return to the land of your fathers and to your kindred, and I will be with you” (Gen. 31:3). He left, along with his wives (four!) and eleven sons (plus Dinah), picking the opportune time when Laban was gone shearing his sheep (Gen. 31:19). It was on the third day that his father-in-law Laban learned of these events. It took seven days’ travel to overtake Jacob. The text says, “and he overtook him in the mountains of Gilead” (Gen. 31:23). 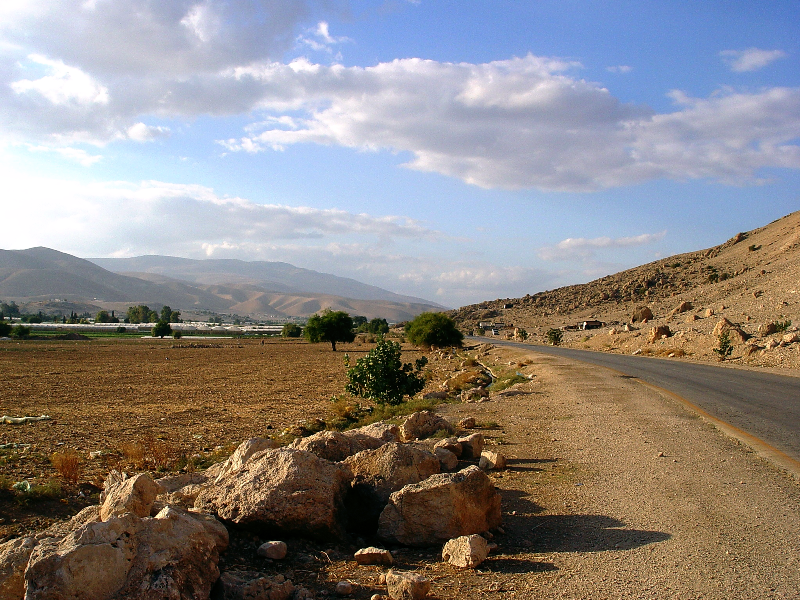 Our photo below shows a view of some of the mountains of Gilead, as viewed from the west side of the Jordan. Mountains of Gilead. Photo ©Leon Mauldin. After he and Laban came to an understanding, Laban returned home to Haran and Jacob continued his journey to Canaan. After what turned out to be a cordial meeting with his formerly estranged brother Esau, Jacob lived a while in Succoth, then made his way to Shechem. Our photo below shows the pass that leads from the area of Succoth (which would be to our backs) toward Shechem. This is the route Jacob and his family and servants would have taken to Shechem. On the right of the photo you can see the modern road which follows this ancient pass. Pass to Shechem. Jacob would have taken this route. Photo ©Leon Mauldin. 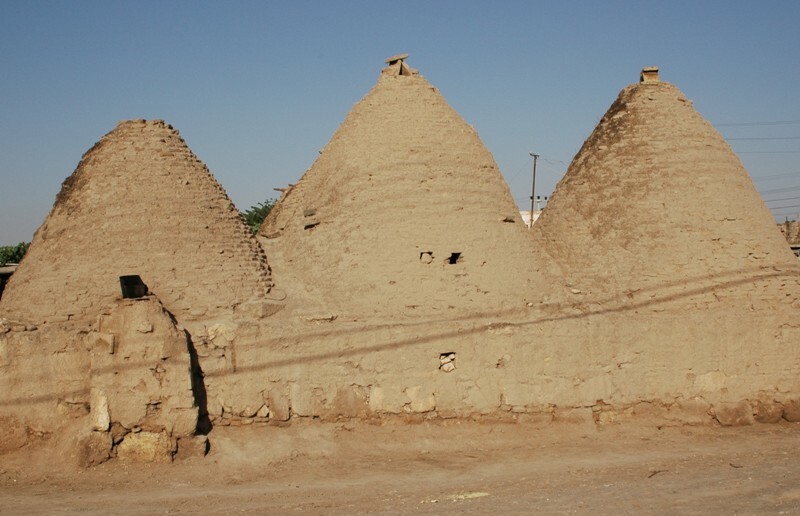 At Haran (Harran) one can see bee-hive houses that are said to be about 200 years old, but built on the same pattern as in the days of the Patriarchs. On the back of the house on your left you can see the oven. 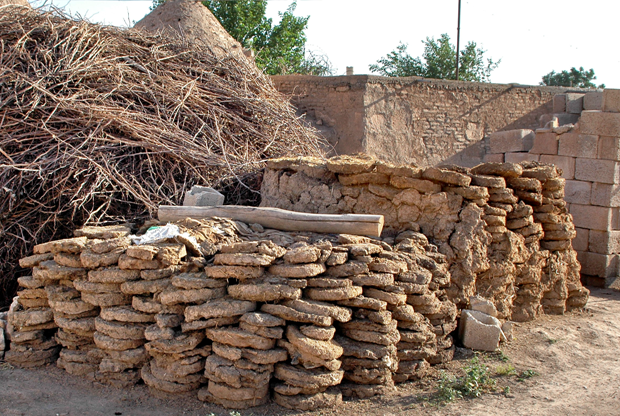 Bee-Hive structures at Haran. View of Oven. Photo ©Leon Mauldin. The fuel for such ovens would be wood and/or dung, as seen in photo below. Fuel for the Fire. Dung cakes & wood for oven fires. Photo ©Leon Mauldin. 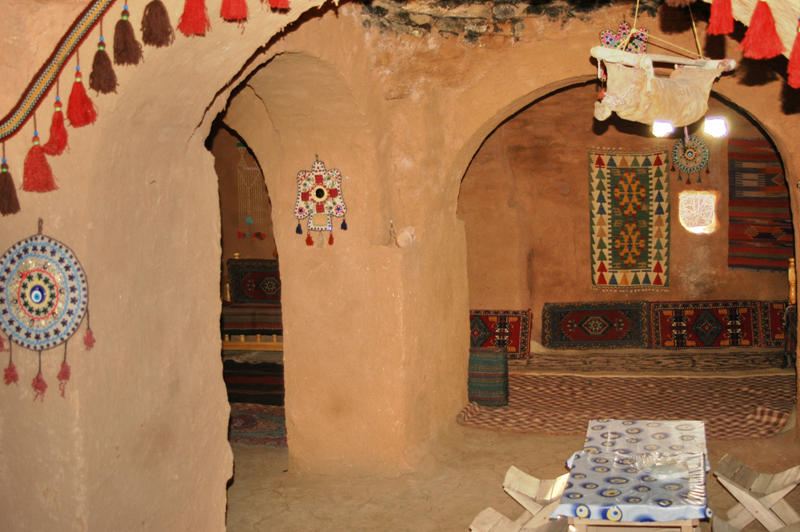 I was able to go inside one of the houses in Haran. It was quite nice. Inside a bee-hive house at Haran. Photo ©Leon Mauldin. In our previous post we made reference to Jacob’s watering Laban’s flock. Genesis 28 tells of his flight from Canaan to Haran of Mesopotamia: “Now Jacob went out from Beersheba and went toward Haran” (v.10). Jacob’s mother Rebekah had said, “Now therefore, my son, obey my voice: arise, flee to my brother Laban in Haran. And stay with him a few days, until your brother’s fury turns away” (Gen. 27:43-44). Ironically, those “few days” would turn into a sojourn of some twenty years! Previously we showed a photo of an ancient well to illustrate how Jacob watered the sheep as mentioned in Gen. 29:10. Our photo today was taken at Haran (modern spelling is Harran). 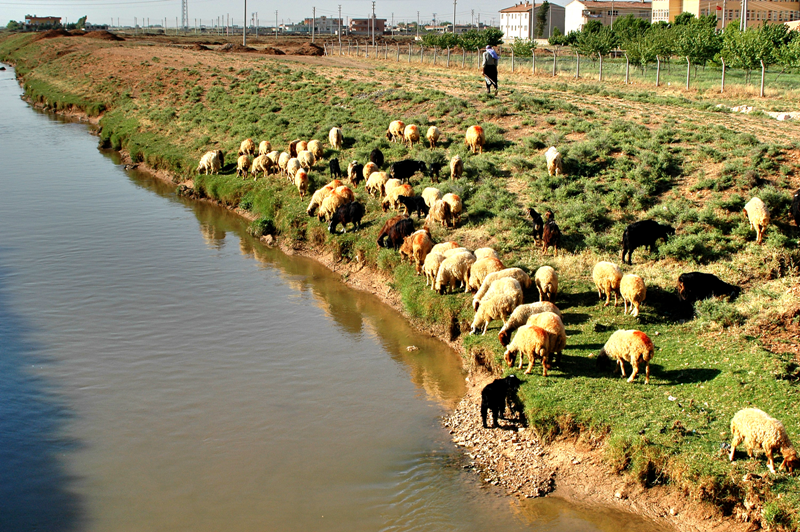 Shepherds continue to lead their sheep to water and grazing these thousands of years later. Shepherd w/Sheep at Haran. Photo ©Leon Mauldin. Jacob agreed to work seven years as a shepherd for Laban in order to marry Rachel. When the time quickly passed the wedding night arrived. But the next morning Jacob awoke to discover that he was married to Leah, Rachel’s sister. When he demanded an explanation from Laban, he told his immeasurably shocked son-in-law that it was not their custom to marry the younger daughters before the older. But he had a solution: let Leah have her one-week wedding festivities, then marry Rachel, on the condition that you work seven more years! Jacob agreed to those terms. After those fourteen (total) years had passed, Jacob worked another six years for Laban, making the total of twenty years we referenced above in our post. Photo below shows the site of biblical Haran. Biblcial Haran. Jacob sojourned in this area 20 years. Photo ©Leon Mauldin. Later, when Isaac died, Jacob and Esau buried him. But there is no mention of all of Jacob’s seeing his mother after sending him away to Haran for what she thought would be just a short while. You are currently browsing the Leon's Message Board blog archives for November, 2010.